The Earth’s climate system is characterised by complex interactions between the atmosphere, oceans, ice sheets, landmasses and the biosphere (parts of the world with plant and animal life). Astronomical factors also play a role in relation to the great changes like the shift between ice ages, which typically lasts about 100,000 years and interglacial periods, which typically last about 10-12,000 years. “You can look at the climate as fractals, that is, patterns or structures that repeat in smaller and smaller versions indefinitely. If you are talking about 100-year storms, are there then 100 years between them? – Or do you suddenly find that there are three such storms over a short timespan? If you are talking about very hot summers, do they happen every tenth year or every fifth year? How large are the normal variations? – We have now investigated this,” explains Peter Ditlevsen, Associate Professor of Climate Physics at the Niels Bohr Institute at the University of Copenhagen. The research was done in collaboration with Zhi-Gang Shao from South China University, Guangzhou in Kina. The researchers studied: Temperature measurements over the last 150 years. Ice core data from Greenland from the interglacial period 12,000 years ago, for the ice age 120,000 years ago, ice core data from Antarctica, which goes back 800,000 years, as well as data from ocean sediment cores going back 5 million years. “We only have about 150 years of direct measurements of temperature, so if, for example, we want to estimate how great of variations that can be expected over 100 years, we look at the temperature record for that period, but it cannot tell us what we can expect for the temperature record over 1000 years. But if we can determine the relationship between the variations in a given period, then we can make an estimate. These kinds of estimates are of great importance for safety assessments for structures and buildings that need to hold up well for a very long time, or for structures where severe weather could pose a security risk, such as drilling platforms or nuclear power plants. We have now studied this by analysing both direct and indirect measurements back in time,” explains Peter Ditlevsen. The research shows that the natural variations over a given period of time depends on the length of this period in the very particular way that is characteristic for fractals. This knowledge tells us something about how big we should expect the 1000-year storm to be in relation to the 100-year storm and how big the 100-year storm is expected to be in relation to the 10-year storm. They have further discovered that there is a difference in the fractal behaviour in the ice age climate and in the current warm interglacial climate. ”We can see that the climate during an ice age has much greater fluctuations than the climate during an interglacial period. 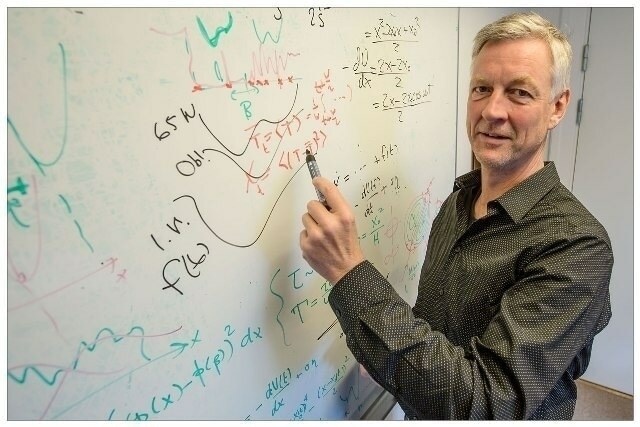 There has been speculation that the reason could be astronomical variations, but we can now rule this out as the large fluctuation during the ice age behave in the same ‘fractal’ way as the other natural fluctuations across the globe,” Peter Ditlevsen. The astronomical factors that affect the Earth’s climate are that the other planets in the solar system pull on the Earth because of their gravity. This affects the Earth’s orbit around the sun, which varies from being almost circular to being more elliptical and this affects solar radiation on Earth. The gravity of the other planets also affects the Earth’s rotation on its axis. The Earth’s axis fluctuates between having a tilt of 22 degrees and 24 degrees and when the tilt is 24 degrees, there is a larger difference between summer and winter and this has an influence on the violent shifts in climate between ice ages and interglacial periods. The abrupt climate changes during the ice age could be triggered by several mechanisms that have affected the powerful ocean current, the Gulf Stream, which transports warm water from the equator north to the Atlantic, where it is cooled and sinks down into the cold ocean water under the ice to the bottom and is pushed back to the south. This water pump can be put out of action or weakened by changes in the freshwater pressure, the ice sheet breaking up or shifting sea ice and this results in the increasing climatic variability. The climate during the warm interglacial periods is more stable than the climate of ice age climate. This new characteristic of the climate will make it easier for climate researchers to differentiate between natural and human-induced climate changes, because it can be expected that the human-induced climate changes will not behave in the same way as the natural fluctuations. “The differences we find between the two climate states also suggest that if we shift the system too much, we could enter a different system, which could lead to greater fluctuations. We have to go very far back into the geological history of the Earth to find a climate that is as warm as what we are heading towards. Even though we do not know the climate variations in detail so far back, we know that there were abrupt climate shifts in the warm climate back then,” points out Peter Ditlevsen.